(Springfield, IL) – As Illinois lawmakers work to assemble a final Illinois budget, substance abuse prevention and treatment advocates today urged legislators to reverse the budget cuts proposed by Governor Pat Quinn that will slash Illinois drug and alcohol treatment for more than 2,500 Illinois residents, including 1,000 women. Since 1995, the number of Illinois women in drug, alcohol has surged 41%, but Quinn this year is still cutting treatment services by 8%, which will toss more than 2,500 out of treatment, of whom nearly 1,000 are women. Quinn’s budget cuts the Illinois Division of Alcoholism and Substance Abuse budget for community treatment providers and funds for addiction prevention for community prevention providers are on a top a 22% cut last year. “Relentless budget cuts are forcing the Illinois addiction healthcare system into a death spiral and women are increasingly suffering the brunt of the budget pain,” said Howe. In FY 2009, there 89,909 individuals receiving treatment services, down from 101,105 in FY 2008, a 11.6% decrease. “By further strangling the drug treatment system, threats to public safety will boil over,” said Howe. (Springfield, IL) — Governor Pat Quinn‘s proposed Illinois budget for next year plans to cut drug, alcohol abuse prevention and treatment services by 8%–on top of 22% budget cut last year. Illinois Alcohol and Drug Dependence Association CEO Sara Moscato Howe explains the stakes in the current Illinois budget battle. 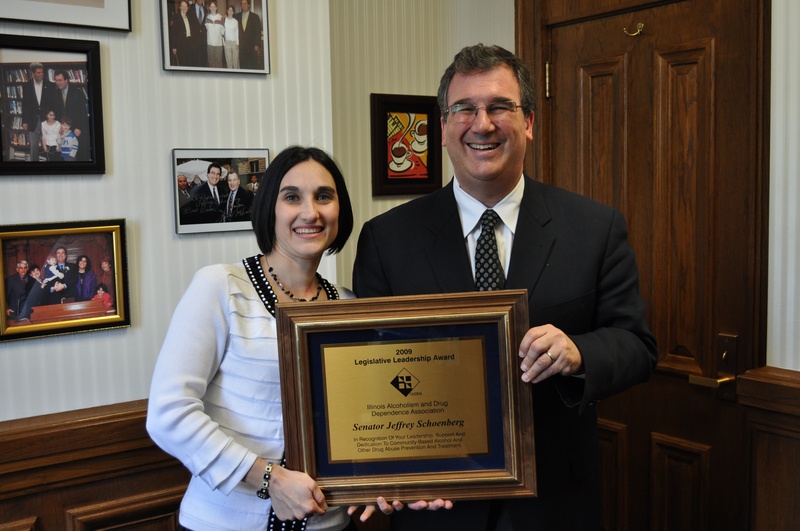 (Springfield, IL) – The Illinois Alcoholism and Drug Dependence Association (IADDA) today announced that its two 2009 legislative honors has been awarded to State Representative Sara Feigenholtz (D-Chicago) and State Senator Jeff Schoenberg (D-Evanston). “Representative Feigenholtz has been a loyal and energetic advocate for addiction health care services who has worked tirelessly on our behalf in the Illinois House,” said Sara Moscato Howe, CEO of IADDA. 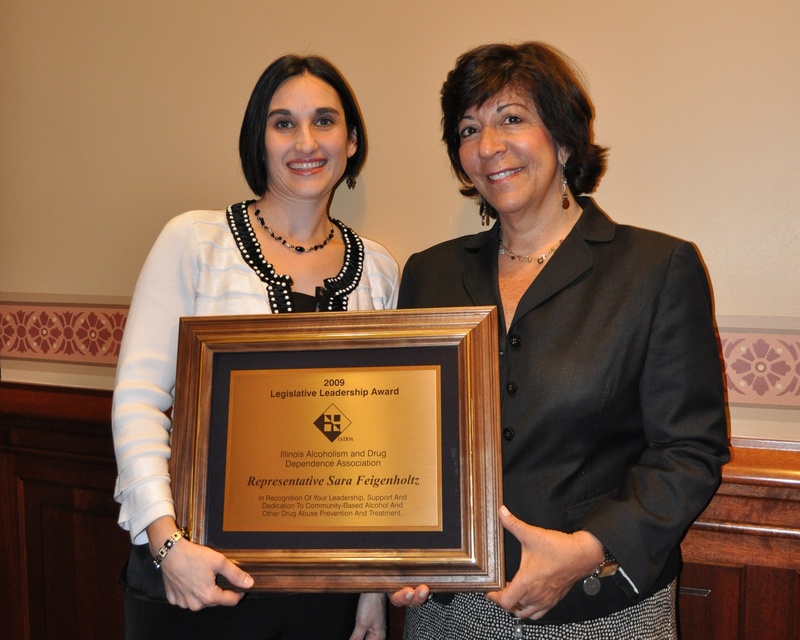 IADDA’s Legislative Leadership Award is presented to one House and one Senate member annually to recognize their efforts to support and advocate for community-based addiction prevention, treatment and recovery services. First elected to the House in 1994, Feigenholtz serves as the Chair of the House Human Services Committee. “Senator Schoenberg has been a enthusiastic and trusted advocate for addiction health care services and we owe him well deserved gratitude for his efforts in the Illinois State Senate,” said Moscato Howe. “In 2009, a resurgent heroin crisis killed more than 100 people in the northern Illinois suburbs, a crisis that is zeroing in on local teens. said Howe. First elected to the House in 1990, Schoenberg was elected to the Senate in 2003.